Earlier this month, at Nokia World 2010, Kevin Thau finally openly confirmed that Twitter is no longer a social network. While this seems to have come as a shock to a lot of people, I couldn’t agree with Kevin more. When I first joined Twitter, it promised to allow me to communicate with my friends in quick short messages. It offered itself as a micro blogging site. Today, it no longer mentions my friends. Instead, it promises to deliver short, timely messages from so-and-so. It is irrelevant whether I even know this so-and-so. Twitter has become a place for people to vie for followers and promote their websites, blogs, companies and, finally, themselves. It is also a major source of news. And, at times, a vehicle to communicate directly with the companies that are willing to listen and engage. Clearly, the focus of Twitter has changed from what it started off as. How do you use it? Is it still a vehicle to communicate with friends or do you find yourself consuming information more than contributing to the conversation? Has this change in direction turned you off Twitter? When it comes to blogging, commenting on forums, using Twitter or Facebook and in general engaging in any kind of online social networking, my one rule has been the one of if you wouldn’t want your mother, your significant other (wife, husband, girlfriend, boyfriend) or your boss to know, don’t say it. Using profanity, discussing a hot coworker, depicting how trashed you got last Saturday night, complaining that you didn’t get a raise or posting pictures of you peeing on the side of your company’s HQ — are all examples of things that, if you know what’s good for you, you probably shouldn’t be doing online. But if you think about it, the realm of things that you should or should not be discussing openly online could be much broader than that. Exactly how broad and where the boundaries of this realm lie is very different for every person, with some topics and behaviors falling into a very gray area. It all becomes even more uncertain when you consider who is impacted, negatively or positively, by your actions. One of those “gray” areas is criticism. Criticism for the sake of criticism is, in my book, nothing more than bitching. But, on one hand, it is very popular and brings readers to your blog and followers to your Twitter. On the other hand, for a lot of people, it represents the very value of social networking and the wisdom of crowds. Many of us have come to rely on blogs and customer reviews when making purchasing decisions. I myself am a strong believer in sharing the negative and positive experiences with products and companies that I encounter. But is sharing a negative opinion always a responsible thing to do? When I say that Acme Anvils make the worst anvils in the world and that mine broke after dropping it off a Rocky Canyon cliff and that Acme Anvils’ customer service was rude to me and offered no help and that I would never deal with them again, who am I impacting? Am I only impacting myself and Acme Anvils? If the answer is yes, then I am doing a good and responsible thing by sharing and warning others would be Acme Anvils’ customers to stay away. But what if my company has, perhaps even unbeknown to me, a large contract to provide services to Acme Anvils? Am I still doing a good thing even though I may be potentially endangering the relationship my company has with Acme? What if Acme Anvils will find my blog post and will terminate the contract based on how my organization’s managers perceive Acme Anvils? Do I, as an employee of an organization, have a corporate responsibility to not express my negative opinions about my company’s clients? The answer to that question becomes even more ambiguous, if you consider future, potential clients. It is possible that at the time of my post, my company has no relationship with Acme Anvils. However, 6 months later we are competing for a piece of business and we lose the deal because of something I had said on my blog. On the other side of this question is my employer itself. As a company, how far do I go to ensure that my employees don’t say bad things about my current clients and target accounts? And do I have a right to ask an employee to take down a post? I don’t have all the answers but would be curious to find out what your experience has been. 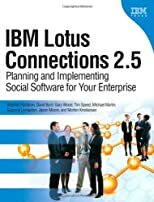 Back in December I spoke in front of the Chicago Lotus Notes user group, GRANITE, on the topic of Social Networking, Social Media and how it all applies to the business world. Here is the slide deck from the presentation. And just in case the embedded viewer doesn’t load for you, here’s a link to the slides on slideshare.net. How do you decide what to blog about? As you are sitting there pondering the topic for your next blog entry or your tweet, how do you decide what to blog and what NOT to blog about? Do you ever worry about blogging about a topic someone has already covered? If it is something from the Internet or the media, what are the chances that someone has already twittered it? Do you worry about being thought a “copycat”? Those are the kinds of thoughts that always end up going through my head whenever I’m considering blogging about something I just read or heard somewhere. Is that a concern for you? Or does it not matter and it’s the point of the Internet and of the social networks to get more and more people to talk and discuss? Whether you’re a seasoned Twitter user or just starting off (like myself), here’s a great collection of tips on how to build up your following.